From the reports that were broadcast Wednesday evening and yesterday morning, it seemed that Seoul Metropolitan Office of Education (SMOE) was about to drastically cut the number of foreign teachers in its schools. SBS broke the story Wednesday night in an exclusive (follow the link to see the broadcast), saying that "700 teachers will leave schools from next year." As they put it, the SMOE budget was being discussed by the Seoul Metropolitan Council, and in the budget for native speaking teachers personnel expenses for next year, 4.4 billion won was being cut for high school NSETs, along with 4.9 billion won from the budget for elementary and middle school NSETs. 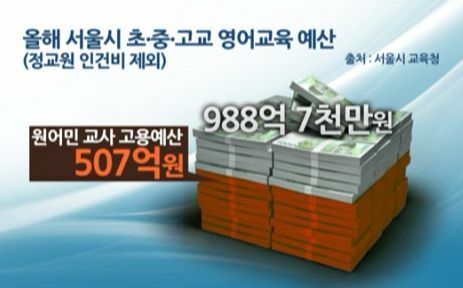 "Native speaking teacher personnel expenses"
2011 - 34.6 million won, 2012 30.2 million won, 4.4 million won cut. According to these budget cuts, from next year when contracts finished it would not be possible to renew contracts, and 255 high school, 252 elementary school and 200 middle school teachers would be let go. In total, of 1,245 NSETs, 57% would leave their schools. It interviewed Kim Jong-uk of the Seoul Metropolitan Council: "In truth, we've discussed the problem of reassigning English native speaking teachers for some time, and in August 2012 and February 2013 native speakers will be gone from middle and high schools." The council also cut 500 million won from the budget for online English education that has attempted to be set up in elementary and middle schools. An SMOE official was also interviewed: "As our teachers' [English] capability increases, we plan to gradually decrease native speakers. So, 'starting in 2012 the number will be gradually reduced." The reason for reducing native speaking teachers is that compared to the large amount of money spent for their salary, house, and food [food?] they don't have very much of an effect. But many are concerned that without a realistic alternative this will encourage private education. The city of Seoul and SMOE's budget for hiring native speaking teachers was 50.7 billion won this year. More than half of the English education budget is set aside for native speaking teacher personnel costs. SMOE evaluated the qualifications of native speaking teachers and found that more than one third were near the lowest level. Kim Myeong-su, Seoul Metropolitan Council operations chairman: "A teacher from our country who can speak both our language and English increases the effectiveness for those taking part in English education." A survey of students and parents found that a Korean teacher who is fluent in English is preferred over a native speaking teacher. "A Korean teacher who is capable with English conversation and teaches well." To prepare native level English proficiency, the Seoul Metropolitan Council and educational authorities maintain that the rest of personnel expenses should be used to hire more cheap Korean teachers. It went on to talk about difficulties in finding native speaking level teachers, and the fears that these cuts will lead to a focus on private education. There are a lot of conflicting figures there - the 2011 NSET budget is 34.6 billion won in the first slide but in the later slide comparing it to the budget for all English education it's suddenly 50.7 billion won. And if the budget is 50.7 billion won and around 10 billion won is being cut (ie. one fifth), why does that lead to 57% of teachers being cut? One starts to wonder if SBS, in such a rush to broadcast its exclusive, got a little sloppy. (I could make a comment like "They've done it before," but since much of that broadcast was deliberate, concentrated negativity, it wasn't actually the result of error). Regarding this - "SMOE evaluated the qualifications of native speaking teachers and found that more than one third were near the lowest level" - the SMOE report (from May) which this refers to said that one third of native speaking teachers were at the lowest level referred to pay scales based on qualifications, which would have already been known when SMOE (or EPIK) hired them. when asked about what category of English teacher was most desirable, the most common choice among parents (62.2%) was "a Korean teacher with excellent English conversation ability who is good at teaching." 62.4% of parents answered that there should be native speaking English assistant teachers, and responded negatively to the suggestion that English assistant teachers be reduced. For some reason this isn't being brought up. In the 2012 Seoul City’s Education Office Fund Decision meeting on the 7th, the Seoul [Metropolitan Council] Education [committee] cut about 4.9 billion won, which was the city’s next year cost for 452 native English teachers. Before the meeting, the Education Office turned in a budget of 31.4 billion won, which already cut 4.4 billion won, largely including the pay for all high school native English teachers. 1) If you are currently a High School Teacher and pass your evaluations, you will transfer to a Middle or an Elementary school. You'd think a "high cost low effect policy" in regard to English education would be right home here. But I digress. Nothing is said to substantiate the assertion that NSETs have a 'low effect' or that "students’ satisfaction rate dropped." Seoul’s Education Office said that nothing has been decided in relation to some media’s broadcast that Seoul City’s native English teachers will be laid off next year. The Education Office said that even though the Board cuts the budget, it can still continue to hire native English teachers through supplementary funding. Most native English-speaking teachers in about 300 high schools in Seoul could lose their jobs next year. In its budget for 2012, the Seoul Metropolitan Office of Education cut about W4 billion (US$1=W1,126) for 225 native speakers teaching at high schools. If the budget is approved by the city council, most of the high schools in Seoul except for 30 English "immersion" and international schools, can no longer afford a native speaker. Currently 1,245 native speakers teach English conversation at primary and secondary schools in Seoul, 895 of them subsidized by the city office of education and the rest by the city government or district offices. "A native speaker earns on average W42 million a year, and we concluded that they are not effective enough to justify the cost," a spokesman for the city office of education said. "A survey conducted for us showed that Korean teachers with outstanding English and teaching skills are more effective in the long term." The office also plans to reduce the number of native speakers teaching at elementary and middle schools from 2013. Students from low-income families will likely bear the brunt of the policy. "Students from well-to-do families may find lessons from native English-speakers dull because they've been attending private tutoring institutes since they were young," an education official said. "But those from poor families should be given the opportunity to learn English with native speakers at school." He added it is "too early to reduce the number of native speakers as long as Korean teachers aren't good enough to replace them." What's interesting here is that suddenly the massive cuts to the elementary and middle school budgets have disappeared, and we're left with the high school cuts which have been in the pipeline for some time. Again, according to the SMOE document, it's already been known that the cuts were coming for high school teachers and the plan is to transfer those who are offered renewal contracts to elementary or middle schools. So, did SBS simply mess up? Did SMOE or the council mess up? Was this an attempt to gauge reaction to something which was only proposed? To be sure, Wednesday night 452 middle and elementary school NSET jobs were on the chopping block, and in the morning, they (pretty much) were not even being talked about. About the Chosun Ilbo's article, I'd say 42 million per NSET per year seems a tad high, especially having met NSETs who were recently hired by EPIK who are working for 1.9 (or was it 1.8?). Teachers like those (especially considering 33% of SMOE NSETs are at the 'lowest' pay level, and few are at the higher levels), would skew the average yearly salary downward. And I'm quite certain that "A survey conducted for us showed that Korean teachers with outstanding English and teaching skills are more effective in the long term" refers to the aforementioned survey from two weeks ago. And again, the results in that survey which favoured keeping NSETs are being ignored. The Seoul Metropolitan Office of Education said it plans to cut about 40 billion won ($3.5 million) in personnel expenses for 225 foreign teachers at high schools in the 2012 budget, which has been reviewed in the council’s budget committee since Thursday. According to another official who wished not to be named, SMOE will reduce the number of foreign teachers at all public schools gradually as its English education policy shifts from “quantity” education to “quality” education. “Besides, the English proficiency of Korean teachers is much better than when we start to expand foreign teachers at public schools in 2005,” the official added. It also adds that teachers will be able to finish their contracts and won't just be laid off. I might have some idea why SMOE would feel that should be mentioned (though, to be fair, they're likely reassuring teachers in this regard due to the lay-off fiasco that threatened GEPIK teachers's jobs as a result of the budget cuts in Gyeonggi-do announced this summer). “The district offices may increase or decrease their budget for foreign English teachers on their own discretion,” the official from the SMOE said. “For the past seven years, I co-taught with four foreign English teachers at my school but the quality of teaching students receive is up to luck. Some will be taught by qualified teachers where as those less fortunate will be taught by teachers who aren’t so well versed in teaching,” said a Korean teacher at an elementary school in Seoul. “Kids who can afford private English lessons will be okay, but those who are less privileged will be victimized by this decision. They are stripped of the opportunity to receive education from foreign teachers. Regardless of the quality of teachers, I think foreigners play a positive role in reducing the cultural gap with students,” said a parent in his 40s. Mr. Kim was curious about the English class at his child's elementary school. He called the office and asked to talk to the native speaker. He heard the vice-principle's voice through the receiver: "Where did that foreign guy [외국 놈] go? Is there a student who speaks English to tell him he has a phone call?" This parent got the impression that the native speaking instructor was neglected in the school. Also a problem is that before the native speaking teacher's classes started, the teacher did not receive special training needed for adapting to Korean schools. For one native speaking teacher, the budget needed for salary, lodging, and household items totals 42 million won per year. As taxes are used, citizens must weigh costs compared to effectiveness. Students generally like the native speaking teacher's classes. SMOE requested that SNU professor Lee Byeong-min analyze public English education policy, and he found that student satisfaction with and interest in their class with the native speaker was generally high, especially with elementary school students. 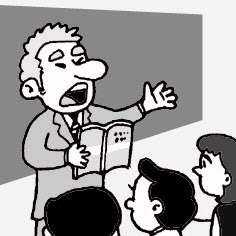 However the number of students who chose the answer "It gives me confidence to speak with foreigners" in regard to the native speaker's class was low. It is difficult to improve conversation skills through a native speaker class which is only once a week. High school students in particular would rather have a Korean teacher who can help them raise their marks than a native speaker. SMOE submitted a budget bill to the Seoul Metropolitan Council cutting about 4 billion won, or the personnel expenses for 225 native speaking high school teachers, from the budget for next year. If the bill passes, high schools will not be able to keep their native speaking teachers, except for 30 high schools such as foreign high schools or schools designated as English focused. It seems inevitable that low income students with no experience of English hagwons will suffer. Supplementary measures such as graded classes to improve English skills [streaming students? ], strengthening the capabilities of Korean English teachers, and strengthening self study must be prepared. In Seoul and the cities of Gyeonggi-do where many students learn English in hagwons, there is less need for native speaking teachers, but in rural areas native speakers make a significant contribution by increasing students' access to English. A problem is instructor supply and demand. Young native speaking teachers who have just graduated from university avoid working in rural areas. Policies tailored to the situations in particular areas are needed more than uniform native speaking teacher policies. It's nice to see an even-handed column; again, it mentions only the high school cuts. Newsis published an article early this morning claiming to be based on what SMOE 'did' on the 9th (ie. today, meaning they got a comment from SMOE before 6am), which declares that there will be cuts to the elementary and middle schools as well as the high school teachers, but the article just seems to rehash SBS's report from Wednesday night. It does say that if teachers finish their contracts next August and want to renew, SMOE will have only 9-11 months of salary and it will not be able to renew them. The high school cuts are already a done deal. The question is whether budget cuts to elementary and middle school NSETs will be passed. SBS was unclear on the source of such cuts, but the Hankyoreh reported that the 4.9 billion won cut to elementary and middle school NSETs was a decsion of the Seoul Metropolitan Council (while the original 4.4 billion won cut to high school NSETs had already been decided on by SMOE when they submitted their proposed budget). Whether these cuts were a figment of SBS's imagination (though a Seoul Metropolitan Council member does say on camera that "in August 2012 and February 2013 native speakers will be gone from middle and high schools"), or whether they are indeed proposed and the council is waiting to see the public's reaction remains to be seen. To be sure, the budget hasn't been officially passed yet, and the official budget won't be announced until this weekend or early next week, or so I've been told. And as always, it's nice to see the media and elected officials selectively interpreting statistics (in regard to the survey that was done) in order to back up their assertions that NSETs have a 'low effect' or that the "students’ satisfaction rate dropped." And no where in this is the mention of the free lunch program - but then I suppose the progressive city council might turn a bit red if one were to suggest that low-income children's only access to native speakers was being taken away in order to give free lunches to the middle and upper classes. It's not exactly the kind of wealth redistribution I would expect from leftists, to say the least. One thing is for certain - it would seem the GEPIK cuts were not an aberration, and NSETs are likely on their way out of public schools (though who knows what effect the campaigns for the national assembly and presidential elections next year will have). Thank you very much for your time and research as a NSET in Seoul it has been suprisingly difficult to obtain well researched information. Please keep up the good work. This was very interesting to me as someone with friends teaching in Korea. Thanks for taking the time to present it in a well-researched fashion. And no where in this is the mention of the free lunch program - but then I suppose the progressive city council might turn a bit red if one were to suggest that low-income children's only access to native speakers was being taken away in order to give free lunches to the middle and upper classes. It's not exactly the kind of wealth redistribution I would expect from leftists, to say the least. Why so surprised? Doesn't blood trump class in the eyes of the ethno-nationalist? "SMOE evaluated the qualifications of native speaking teachers and found that more than one third were near the lowest level"
And this is a feature, not a bug, in a program where a first-year teacher with no experience is preferable to one who is highly qualified due to a lower salary. Meanwhile, hagwon throughout the peninsula are licking their lips in anticipation.